SOUTH BEND, Ind. (AP) — Arike Ogunbowale overcame poor shooting to finish with 21 points and lead four players in double figures as No. 1 Notre Dame pulled away from Penn in the second half on the way to a 75-55 victory on Monday night. 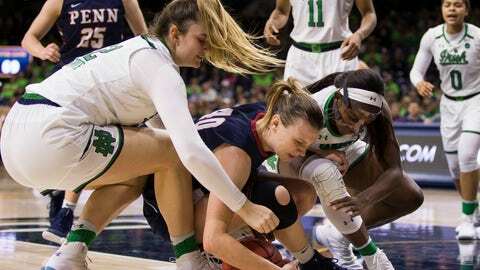 Jessica Shepard had 17 points, Brianna Turner 16 and Jackie Young 12 as Muffet McGraw’s Irish (2-0) overcame Ogunbowale’s 6-for-19 shooting effort and 18 total turnovers after raising their 2018 NCAA championship banner in the Purcell Pavilion. DENTON, Texas (AP) — Lashann Higgs scored 20 points to reach 1,000 in her career in a matchup of a longtime coach and her mentor. This was the first meeting between the two head coaches. Texas (2-0) scored the opening seven points of the game and it was 23-11 at the end of the first quarter. Texas (2-0) led 34-21 at halftime.